There are some myths out there as to whether you can apply gelcoat over epoxy. Andy Miller addresses the issue. He has a great understanding of WEST SYSTEM Epoxy, having used it for years as owner and chief repairman of Miller Boatworks in Herbster, Wisconsin. Andy knows his stuff. What’s even better is that, when he’s unsure about a detail, he contacts us for the right answers. Andy wanted to conduct some experiments to either validate or debunk what most people in the marine industry are taught; that you can’t apply gelcoat over epoxy. I relayed the information that we’ve gathered over 30 years of in-house testing. While he found that interesting, he didn’t want to mimic our experiments. He chose to take a different approach, replicating the variables the average service technician faces while doing a repair in the real world. To ensure the amines won’t compromise the cure of the polyester gelcoat, standard mixing and curing instructions apply. Before coating a fully cured layer of epoxy with polyester gelcoat, prepare the surface properly to remove any amine blush. Allow the epoxy to cure to the point where sanding produces a fine powder. Wash away amine blush with water and an abrasive pad such as a 3M #7447 Hand Pad. Dry the surface with paper towels, or rinse well and allow it to air dry. Sand the epoxy with the sandpaper grit level recommended by the gelcoat manufacturer. To ensure thorough mixing and that the epoxy would completely cure, he took the additional steps of pouring the mixed epoxy into a new container and stirring it again before applying it. He then allowed the application to cure for 3-4 days. This wasn’t required but would help ensure consistent results, especially if there are multiple people doing this in a repair or manufacturing environment. 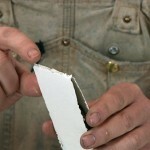 Andy focused on three common factors in repair work: fine edge bonding, flexing stress, and cleavage strength. All of these tests were done comparing the three WEST SYSTEM hardeners he commonly uses with 105 Resin: 205 Fast Hardener, 206 Slow Hardener and 207 Special Clear Hardener. The fiberglass used for all the tests was 738 Biaxial Fiberglass Fabric with Mat. Fine edge bonding is important when finishing off a gelcoat repair. As the gelcoat is sanded down and feathered into the surrounding area, the perimeter of the patch becomes very thin, almost translucent depending on the color you’re working with. What Andy is looking for here is to see how well this fine edge stays intact. When gelcoat gets this thin it tends to lift or chip if not bonded solidly to the substrate. All three epoxy samples performed as well as the polyester sample. When sanded to a fine edge and picked at with a razor blade, no lifting or separation of the gelcoat was noticed. Fine edge bonding test. Scraping the edge of the gelcoat with a razor tests how well the fine edge of the gelcoat stays attached to the epoxy layer below. Boats flex while in use. In order to prevent stress cracks in the gelcoat, this material needs to be able to move with the boat without delaminating or peeling apart from the substrate. Andy made three samples of single layer 738 Biaxial Fabric wet out with 105 Epoxy Resin and either 205, 206 or 207 hardener. 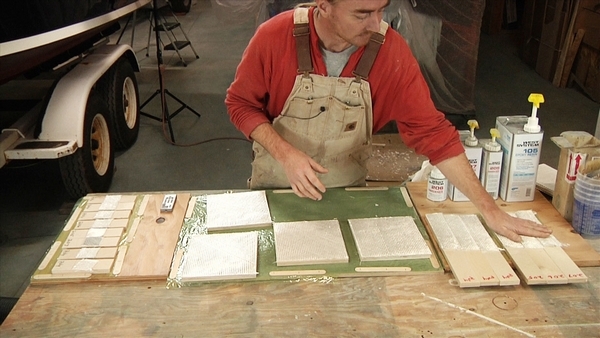 He finished each with a polyester gelcoat to test how well it would bond. The gelcoat was sealed with PVA and allowed to fully cure. Here again, all of the epoxy samples performed as well as the polyester sample. Each of the samples were bent and twisted to varying degrees far beyond what would normally happen on a boat underway. Stress cracks were noticed as he intentionally broke the fiberglass sample in half looking for bonding failure along the fracture point, but there was no lifting or separation of the gelcoat from the cured epoxy. Flex stress test. The panel was intentionally broken in half looking for bond failure along the fracture point. While it’s good to have cleavage strength data, it can be helpful to simplify that into something more concrete and easily understood. Andy made sample pieces with each of the three hardeners, then made identical polyester samples. When the epoxy samples were cured, water washed and sanded, he bonded the epoxy and polyester samples together with polyester gelcoat. When these gelcoat over epoxy samples were fully cured, he ripped them apart to determine a clear pass/fail on the bonding strength. Whichever side broke free from the gelcoat, comparatively, did not have as strong of a bond. The results surprised Andy. The samples showed that the polyester gelcoat bonded to the epoxy laminate but the amount of force to break the samples and failure mode varied between the different systems. Our experience from many years of testing has taught us that WEST SYSTEM hardeners all achieve similar cured properties so there should not be a difference. 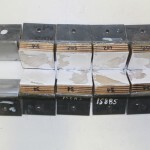 Andy’s work illustrates the strength and weakness of shop floor testing. He was able to quickly determine if the adhesion of polyester gelcoat to an epoxy laminate was acceptable, but he was unable to measure it quantitatively. Experienced epoxy users like Andy also know that they have to evaluate the results achievable in their shop but may need testing results from a lab to reach a final conclusion. We always encourage our customers to test materials in their shop to gain confidence, and we remind them we are willing to support them with additional testing in our Technical Center. While this wasn’t “shop floor testing” like Andy did, a couple of us analytical types at WEST SYSTEM wanted to put some hard numbers to this data. When Andy made up the cleavage strength samples of gelcoat over epoxy, he made several more for us so we could do some of this testing ourselves. 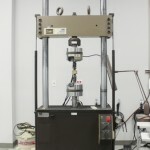 Using an ASTM standard that is typically used for cored composites, and our MTS load frame, a force was exerted perpendicular to the bond line in order to cause failure. To determine the strength of the various bonds, we compared the amount of force required to cause each sample to fail. The MTS machine pulled apart samples to determine the amount of force needed to cause the failure of gelcoat over epoxy. Because we expected the plywood glue to fail before the polyester and epoxy, I reinforced the plywood edges without reinforcing the polyester or epoxy glue joint. 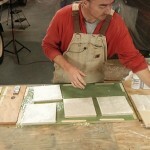 I prepared the pieces for testing by applying fiberglass and epoxy on each of the four sides that had exposed end grain. When they cured, I cut this laminate with a razor blade directly on the gelcoat line. 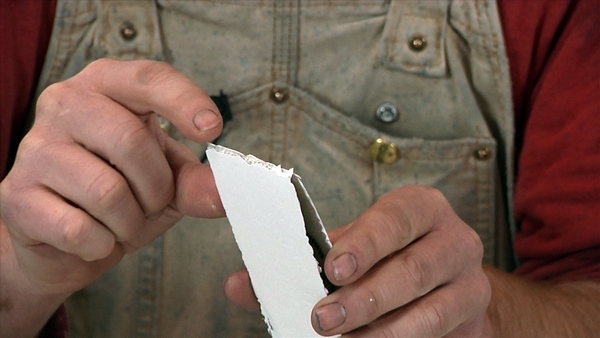 This fiberglass and epoxy reinforced the plywood, and cutting through the fabric on the gelcoat line forced the failure to occur in the bond line between the pieces of plywood. 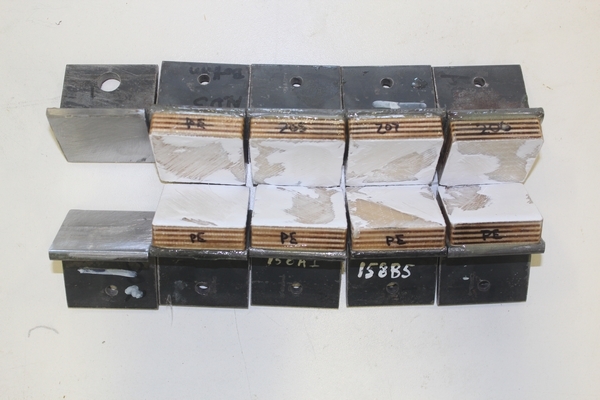 The results are recorded on the Tensile Strength table, and as you can see the strength is nearly identical for all four samples. Each of these samples (including the polyester-to-polyester sample) failed in the polyester/glass laminate. This more quantitative tensile adhesion testing confirms that polyester gelcoat will properly cure and adhere to epoxy. The samples after failure. The results of the maximum loads are listed in the table below. Based on Andy’s and our own testing and experience, I am confident saying WEST SYSTEM Epoxy is a suitable substrate for polyester-based material such as gelcoat. Gelcoat-to-epoxy adhesion will be as reliable, if not better than, a polyester-to-polyester adhesion, providing proper steps are followed throughout the repair process. A screen capture of the accompanying video to this article explaining the tests. 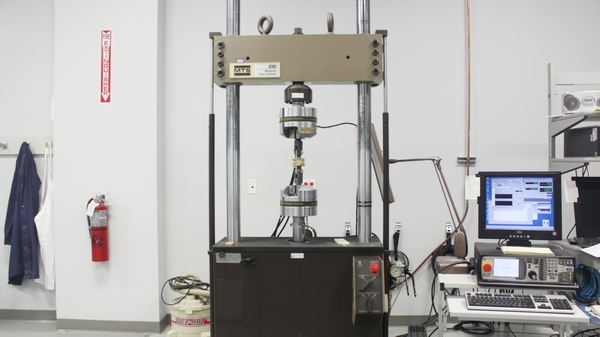 The MTS machine pulled apart samples to determine the amount of force needed to cause failure. This entry was posted in Materials Testing, Techniques & Tips and tagged #42, Epoxyworks #42, Gelcoat, Mike Barnard, Miller Boatworks, Spring 2016 on February 23, 2016 by ewadmin.